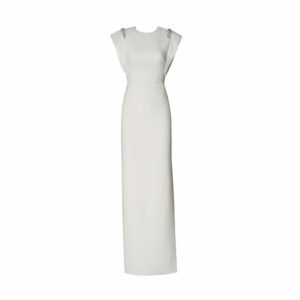 For a reception in Tonga, Meghan wore Irish Brand “Theia”, in a custom white version of their Cap-Sleeve Beaded Silk Satin Column Gown. The dress is pictured in navy below. For a reception in Tonga, Meghan wore Irish Brand “Theia”, in a custom white version of their Cap-Sleeve Beaded Silk Satin Column Gown. 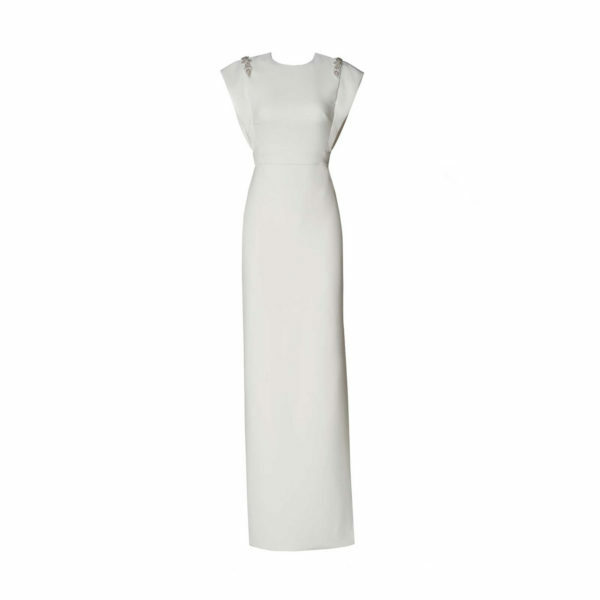 As seen on The Duchess of Sussex, this ivory crepe column gown features flanged shoulders, a jewel neckline, and side slit. The shoulders are accentuated with hand embroidered appliqués of crystals and micro glass beads.